Well, here it is. 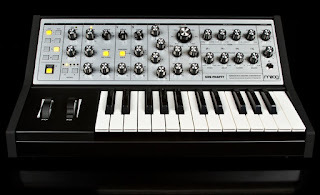 Moog's latest and greatest, the Sub Phatty, in all its glory. A 25 key pure knob affair, coming in at $1,100, meaning we'll see it at about $1000 as the street price. It's incredibly similar to the Little Phatty in form, with the wedge shape being identical. The main new ingredients are the improved oscillators, which take less time to warm up and are more stable, and the multidrive circuit, which should allow for better aggressive tones. You can hear a myriad of demos on Moog's Soundcloud, or watch the video below for the full experience. I'm really impressed by the Sub Phatty's drum sounds. It seems like a full on improvement in sound quality from the Little Phatty, and that's no easy feat.